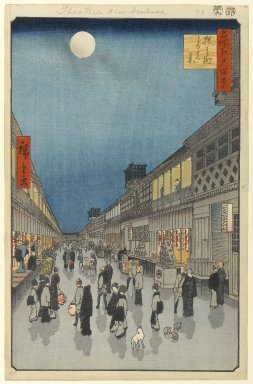 View of an autumn night in Saruwaka-machi, the segregated theater district of Edo. Throughout most of the Tokugawa Period kabuki and puppet theaters were located in two separate areas of Edo. Following a fire that destroyed one of the districts in 1841, the theaters were relocated to Asakusa, already an established center of popular pleasure. The new theater district was named Saruwaka-machi after Saruwaka Kanzaburo, the founder of Edo kabuki and first in the premier Nakamura-za lineage. On the left side are teahouses and waitresses are seeing off guests from the veranda; on the right side are kabuki theaters with the boxed turrets perched on the roof above each entrance. Generally performances were confined to the daylight hours. Details shown here convey that it is the end of the day. Men from the teahouses hold bright lanterns to guide their guests back to the entrance gate and among the figures are two who ply their trades at night and a fortune-teller clad in solid black.